He writes that “Gaza is about a Big Lie composed of a thousand, often seemingly abstruse and arcane, little lies. The objective of this book is to refute that Big Lie by exposing each of the little lies.” His meticulous inquest into Israel’s wars on Gaza raises many questions about society, and his findings are particularly generalizable to other current wars. The book primarily focuses on Operation Cast Lead (2008-09), the Mavi Marmara (2010), and Operation Protective Edge (2014). Finkelstein, with his characteristic thoroughness, details the pertinent background, the course of Israel’s military assaults, and exoneration of Israel. His unique contribution is his examination, by “methodical parsing of logic and evidence,” of the official whitewashing investigations. With his synopsis of Israel’s preceding history since 1948, a pattern emerges of Israel’s surreptitious provocations that conceal Israeli aggression, use of disproportionate military force and targeting of civilians, specious legality, and lies that exonerate Israel and permit ever-increasing brutality. Operation Cast Lead was preceded by Israeli assaults, cruelly named 2004 Operation Rainbow, 2004 Operation Days of Penitence, 2006 Operation Summer Rains and Autumn Clouds, 2008 Operation Hot Winter. After the democratic election of Hamas in 2005, Israel imposed a punishing blockade which UN Special Rapporteur John Dugard noted was the first time an occupied people was subject to sanctions and that were a violation of major UN Security Council and General Assembly resolutions and a ruling by the International Court of Justice. Under the blockade, 80% of Gaza’s water was unfit for human consumption and half the population was unemployed and food insecure. Israel attacked a civilian population imprisoned within its territory and already decimated by a ruined economy. Israel attacked Gaza with the most advanced combat aircraft in the world, flying nearly 3000 sorties and dropping 1000 tons of explosives. Its brigades were equipped with sophisticated intelligence-gathering systems and weapons, while Hamas had several hundred rudimentary rockets and mortar shells. What was also obvious was that Israel systematically targeted Gaza’s civilian infrastructure: It destroyed or damaged 58,000 homes, 280 schools and kindergartens, 1,500 factories, electrical, water, and sewage installations (more than one million Gazans without power during the invasion and ½ million cut off from running water), 190 greenhouse complexes, 80% of agricultural crops, and nearly 1/5th of cultivated land. In all, 1400 civilians were killed, including 350 children. Amnesty International and the Goldstone Report established that Israeli soldiers, not Hamas, used civilians as human shields. The Goldstone Report found that much of the devastation was premeditated and anchored in a military doctrine. The Report stated that the assault constituted “a deliberately disproportionate attack designed to punish, humiliate and terrorize a civilian population….” The Report also paid tribute to “the resilience and dignity of the Gazan people.” It recommended that individual states “start criminal investigations in national courts, using universal jurisdiction, where there is sufficient evidence of the commission of grave breaches of the Geneva Conventions of 1949. It noted Israel’s “seemingly deliberate cruelty” to children. On April 1, 2011, Goldstone disowned the “devastating UN report of Israeli crimes carrying his name.” The gist of his recantation was that Israel did not commit war crimes and that it was fully capable of investigating violations of international law. The other three investigators issued a statement unequivocally affirming the Report’s original findings. Finkelstein goes into considerable detail about Goldstone’s recantation which essentially legitimized Israel’s alibis: that Israel does not target civilians but that civilian casualties were due to error or were collateral to targeting militants, and that its grossly disproportionate destructiveness was justified self-defence. Goldstone attributed his recantation to a blurry drone photograph of the Al-Samouni family compound that was only disclosed 22 months after the massacre of 29 family members. There was ample evidence that the Israeli Defense Force (IDF) knew that the Al-Samounis were civilians; and Israeli soldiers based close to the house had warned the commanding officer, Colonel Malka, that the Al-Samounis were civilians. Finkelstein meticulously compares findings from the Goldstone Report, from Goldstone’s retraction, from Amnesty International and from the UN Experts Report. Israel’s killing of nine passengers on the Mavi Marmara, part of the Gaza flotilla to break the blockade of Gaza, followed the same pattern of previous assaults: Israel characterized their victims as terrorists; the pre-planned attack by Israeli commandos was vastly disproportionate for the commandos opened fire on the unarmed passengers with tear gas, smoke and stun grenades, and live ammunition. Israel appointed Jacob Turkel, a former Israeli Supreme Court justice, to chair Israel’s investigation, and UN Secretary General Ban K-Moon appointed the corrupt and criminal Colombian president Alvaro Uribe to chair a UN Panel. The UN Report invented a novel legal fiction by differentiating the land and sea blockades as if boats are for smuggling weapons, thereby justifying the naval blockade and attack on the Mavi Marmara. The section on Operation Protective Edge focuses on the betrayal of Gaza by Amnesty International and by the UN Human Rights Council. Finkelstein attributes these Israeli aggressions as reaction to its defeat by Hezbollah in 2006 and its need to prove its deterrence capacity. The Dahiya doctrine refers to a military strategy of acting immediately, decisively, and with a force that is disproportionate; Dahiya is a suburb of Beirut that was flattened by Israel in the 2006 war. Israel assassinated Hamas military chief Ahmed Jabari and exacerbated Israeli racism and paranoia through its concealing facts about the killing of three settlement youth. The Netanyahu government seized a confluence of events to launch its most massive attack: Arab Spring had turned into Arab Winter, with Egypt again closing the Gaza border; the 2014 downing of the Malaysian plane deflected attention from Israel, and Israel bombed Gaza hours later. The basic facts about Israel’s disproportionate assault on the imprisoned population are heart wrenching. Hamas killed 73 Israelis of whom only 8% were civilians while Israel killed 2200 Gazas of whom fully 70% were civilians. Israel killed 550 [recent figure 556] children, and Hamas killed one Israeli child. The ratio of civilian dwelling destroyed was 18,000:1. Amnesty ignored evidence from unimpeachable Israeli sources that Hamas fighters exiting the tunnels targeted Israeli soldiers, not civilians. Both the Amnesty and UN investigations of Operation Protective Edge refused to accuse Israel of committing war crimes and crimes against humanity or of violating the UN Charter or the Geneva Conventions. These reports also presumed an equivalence of suffering by Gazans and by Israeli Jews. Finkelstein’s quotations from Amnesty and from the UNHRC show how their reports distorted or omitted even their own evidence. They evaded acknowledging that Israel intentionally targeted civilians and destroyed the necessities of life, including medical facilities, water and sewage infrastructure, power stations, and subsistence and commercial agriculture. The official reports allow Israel’s alibi that it only targets “militants.” Finkelstein asks how they were able to identify militants in the 18,000 homes they destroyed. Israel’s surveillance technology and on-the-ground soldiers were ostensibly unable to differentiate children who were feeding birds or children playing on a roof from militants. Amnesty cited the Israeli allegation that Al-Wafa was a “’command center.’ It could have noted that ‘command center’ was Israel’s default alibi for targeting.” Disregarding its own satellite evidence that falsified Israel’s claims, Amnesty still maintained that the status of Al-Wafa remained an open question. The UNHCR Report on the killing of 18 people waiting to be evacuated from the UNRWA Beit Hanoun School overlooked evidence that Israel intentionally and premeditatedly killed civilians. A pattern emerges in which Israel surreptitiously provokes Hamas, compelling a reaction in which Hamas appears to be the aggressor and the initiator of hostilities, and Israel claims its right to defend itself by any means necessary. 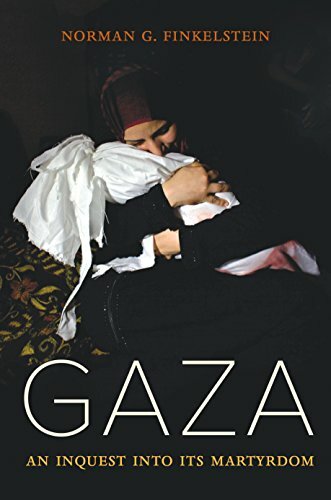 In this book Finkelstein expresses outrage that Israel is exonerated by prestigious people and institutions, allowing escalation of war crimes and crimes against humanity. Persistent exposure of the little and big lies is an essential part of the struggle for there to be Never Again. Judith Deutsch is a columnist at Canadian Dimension Magazine, described as Canada's longest standing magazine of the Left, and a contributor to CounterPunch. She is also a former president of Science for Peace and is a practicing psychoanalyst.